Marlton, N.J. – Samaritan Healthcare & Hospice recently honored Julie Weitzman, lead development coordinator, Cherry Hill resident, for 20 years of service to the organization to the not-for-profit hospice and palliative care organization at this year’s Winterfest celebration – an annual event recognizing employees and volunteers for their service milestones and dedication to the not-for-profit organization. Julie joined Samaritan Healthcare & Hospice as a community relations assistant in 1998 and quickly advanced to her current role as lead development coordinator. In this position, Julie is responsible for planning Samaritan’s two biggest fundraisers – the annual golf tournament and gala – and assists with Samaritan’s annual Tree of Life events. Throughout the past 20 years, she has helped raise more than $4.6 million to support Samaritan and its various programs. For Julie, her passion for Samaritan does not end in the workplace – her entire family is involved in some capacity with the organization. Her husband Ian has volunteered at Samaritan for the past 20 years, and her sons Jacob and Eli also volunteer as part of Samaritan’s SamariTEEN volunteer program. 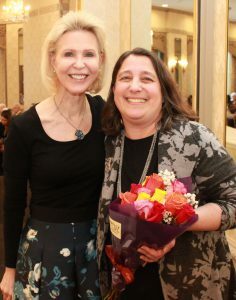 Caption: Julie Weitzman, Lead Development Coordinator with Mary Ann Boccolini, President and CEO of Samaritan Healthcare and Hospice.